Recently, we received an inquiry from someone who was trying to make sense of xAPI. They had a few specific questions that were interesting, so we thought it made sense to share the answers here. Is xAPI installed on a platform? 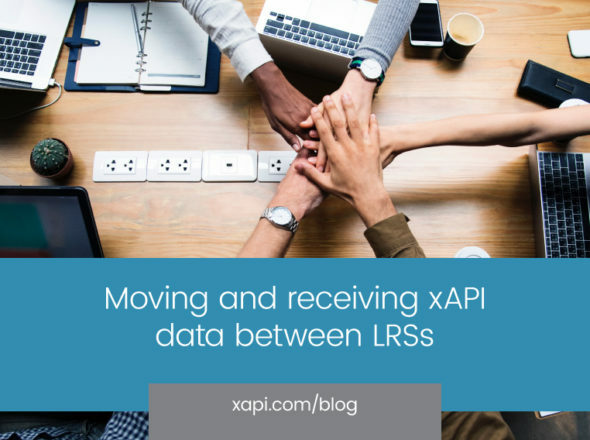 When it comes to how xAPI relates to platforms, xAPI is a communication and data model protocol specification that defines a Learning Record Store (or LRS). An LRS implementation is an application that can either be a premised web service or a remotely hosted (public- or non-public web service). A simple, spec-based LRS can act like a “platform” by itself. But for it to be a full-featured platform, the spec-based LRS would need to have additional tools added on to it. Can xAPI monitor device activity? An LRS by itself does not do any “monitoring” so to speak. Content and/or eLearning systems use the web service communication protocol defined by the xAPI spec to store data in and retrieve data from the LRS. Is testing a requirement for implementing the xAPI spec? An LRS implementation (whether a simple spec LRS or a more feature rich LRS) should itself be tested to conform to the xAPI specification. There is a publicly available OSS testing framework, called the LRS Conformance Test Suite, and web tool for testing an LRS, which can be automated. The Test Suite is managed and maintained by ADL, or the Advanced Distributed Learning Initiative, a US government organization that conducts research and development on distributed learning or eLearning. As such, all major, recognizable LRS vendors use the testing tool to ensure their LRS conforms to xAPI. Rustici LRS, a product we offer at Rustici Software, is continually tested to make sure it conforms with the xAPI specification. Whether or not an application is integrated with Rustici LRS wants to additionally test that it still conforms when integrated is up to our customers. For example, our customer Watershed uses the Rustici LRS and still completes and passes the test suite. The LRS available via our SCORM Cloud product also undergoes this type of testing. Content and/or systems that communicate with an LRS should be independently tested but are generally considered to conform to the xAPI specification when they can successfully communicate with a conforming LRS. For content/systems it is more important that the information model they provide/consume is tested fully. As always, if you ever have questions about xAPI or our products, reach out. Brian Miller, or B. Miller, is the most pedantic person at the office, which is saying something. That skill makes him great at ensuring our products support the standards, which is precisely what he spends his days doing.